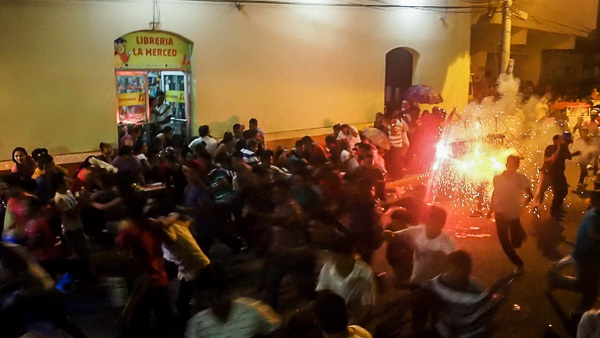 We stumbled upon this fantastic festival in Leon, Nicaragua, called ‘Dia de la Virgen de Merced’ or as we like to call it, the weirdest festival in Central America. 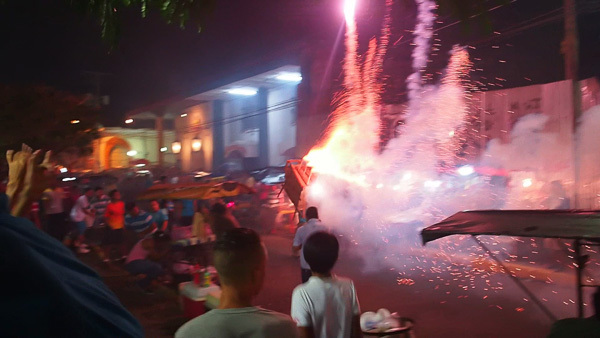 The festival is all for Leon’s patron saint, the lovely Virgin Saint of Mercy and the main aim is to shoot fireworks at you from a flaming bull’s head. Okay, they aren’t real bulls but they are just as scary when they have fireworks attached to them! It was definitely one of the most memorable things we saw in Central America. The actual day of paying respect to the patron saint is on the 24th of September. There’s parades with floats and everything you would expect in a normal religious celebration. Personally, that’s not something we normally find that interesting. What we do find interesting, though, is what happens the night before when the night sky is thick with excitement and fireworks. 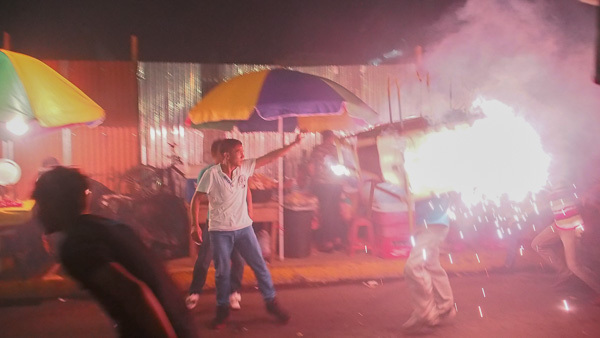 For the life of us we cannot figure out how fireworks being shot at you from a bull’s head relates to the Virgin Saint of Mercy, but hey, it’s Latin America. How did the night go down? All the excitement happened in the streets around Parque de la Merced and the Iglesia (church) de la Merced. Inside the church there were a few hundred people watching a service and praying. Outside in the square, there were thousands more just waiting. Everyone from kids, families, old people and teenagers. While we were walking around looking at all the people and stalls, some brass music suddenly started. The church service had ended and a 4 piece band was playing some of the scariest devil sounding music we’ve ever heard. Unleash the flaming bull’s head! While the music was playing, some big fireworks went off in the distance. Then the teenagers started moving onto the road, jumping with excitement. At the same time the families started to huddle in the middle of the square. In the chaos we noticed a man appeared with a big wooden crate on his head next to the church. This was the bull’s head we had been hearing so much about. At that point we were a little disappointed, thinking is this it? Little did we realise that the crate had just had its fuse lit. 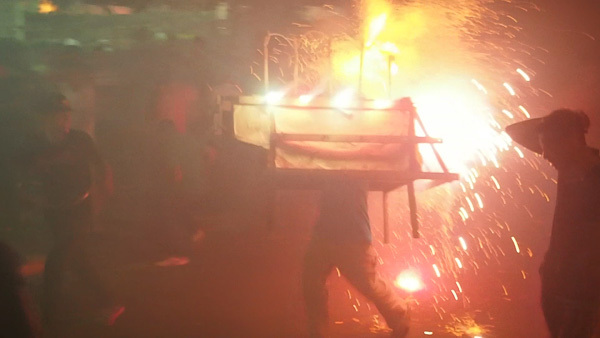 Consequently, that boring crate soon had flares and sparklers going off as the man slowly danced down the street. Then, seconds later, bottle rockets were flying from his head into the crowd! People were scattering and the music was getting louder. Suddenly out of nowhere a second bull’s head appeared! Both running around shooting bottle rockets at the crowd, Mariana even had two stray bottle rockets give her arm glancing blows. After what felt like an age, but was only minutes, both started to run through the crowd with bigger fireworks shooting into the sky from their heads. Just as quickly as they started, the first round of fireworks was over. We counted ourselves lucky we hadn’t got hurt and then stayed for the next one. This happened every hour on the hour for the next 5 hours. Every round it felt more dangerous, people were getting closer and more daring, trying even harder to trip the bull. Luckily though, no one was hurt and the night ended with out any major incidents. Related post: Love strange festivals? Why not a drunk horse race? 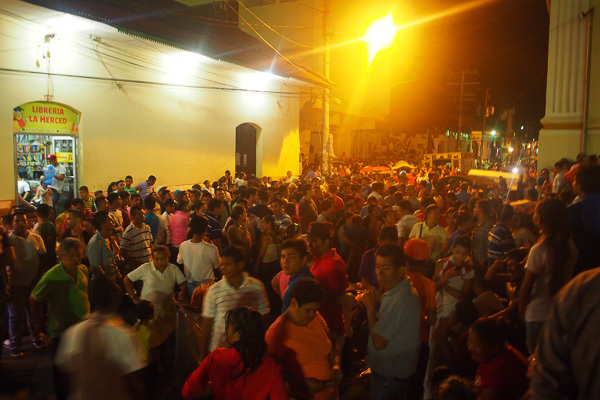 The combination of the music, the tension in the air and the youthful excitement made the festival for the Virgin Saint of Mercy one of the most amazing experiences of our time in Central America. The ever handy festivals section in our Lonely Planet: Central America on a shoe string. A great section of the book that has some fun things to aim for that you would not normally hear of or find out about. We stayed at Lazy Bones Hostel to relax a little. They have a pool! If you want a bit more of a party vibe you should stay at Big Foot Hostel. For good reasons it is one of the best party hostels in Central America.